If you know me, you know that I love delicious home cooked hits-the-spot hearty stick-to-your-ribs comfort food. One dish that definitely fits that description is baked mac 'n' cheese. It's warm and cozy and fills you up. When I made this for my weekly get together, Casey said that this was GLORIOUS! Yes, she really did use that word. I certainly won't argue with that! So, now that you know that it's GLORIOUS, aren't you just dying to give it a try??? I know you'll love it, especially if you try it with my Stewed Tomatoes. I literally NEVER make one without the other. In a large pot of salted water, boil the pasta until just al dente. Don't over cook it! Drain it, pour into a large buttered casserole dish, and set aside. Meanwhile, in a large sauce pan, melt the better. Add the flour and stir until it combines to make a paste. Add milk and whisk until well combined. Add salt, pepper, and cheeses. When all of the cheese has melted, pour over pasta. Combine extra melted butter and bread crumbs. Sprinkle over pasta. Sprinkle Parmesan cheese over all. 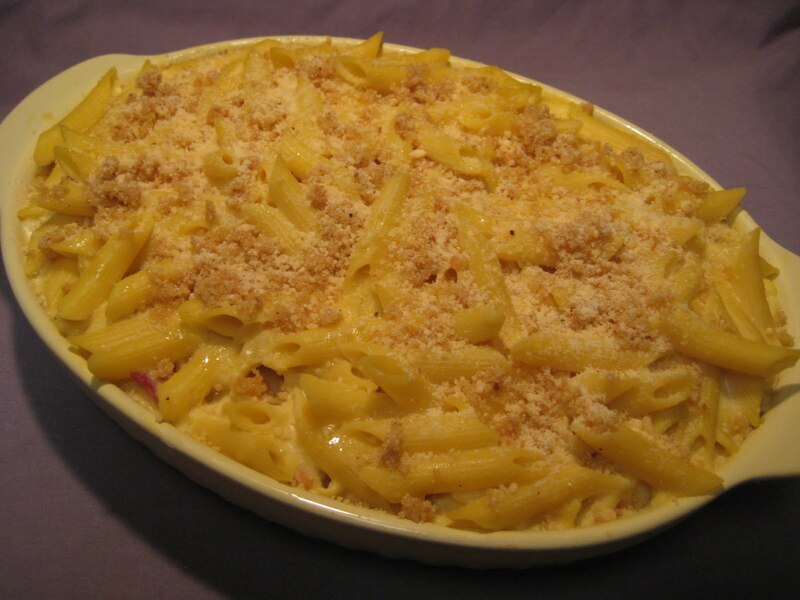 Bake for about 30-40 minutes or until the cheese sauce is bubbly and the bread crumbs are lightly browned. When you salt the pasta water, be generous. The water should be as salty as a broth. (Some even say that it should be as salty as the ocean). It really makes all the difference in the world. Using shredded cheese makes for easier melting. Just sayin'. Substitute any kind of cheese you like, especially cheeses with a sharp flavor such as bleu cheese or Gruyere. When I made it for the gang, I added cooked bacon. They loved it! Just place a cooling rack on a cookie sheet, then lay the strips of bacon over it. Bake in your oven until the bacon is crisp but not burnt. Then chop it up and stir it into your pasta with the cheese sauce. You could even add a steamed vegetable to it, such as chopped broccoli or asparagus.